Last year, Rittal TS Enclosures and LCP high density cooling products were selected as the infrastructure solution for a single event – the DARPA Cyber Grand Challenge. The Defense Advanced Research Projects Agency, an agency of the U.S. Department of Defense responsible for the development of emerging technologies for use by the military, sponsored this first ever Cyber Grand Challenge (CGC). The CGC was the first ever of its kind — a completely autonomous, machine vs. machine cyber hacking tournament in ‘Capture the Flag’ style. Seven teams from around the U.S. were selected to participate in the contest. Each team was provided a Rittal TS8 – LCP suite supporting a high performance output computer cluster. The teams had two years to program their systems to perform in the final event. Their specially-engineered systems went computer-against-computer to evaluate software, test for vulnerabilities, generate security patches and apply them to protected computers on a network. In the end, CGC validated the concept of automated cyber defense, without human intervention. The final event was held at the Paris Hotel in Las Vegas, NV on August 4, 2016 in front of a packed Grand Ballroom. For more than twelve hours the systems challenged each other: fighting off attacks, infecting other systems, identifying and defeating viruses and most critically, taking corrective action. Rittal Corporation was honored to be part of this historic event. The winning team’s system is on display at The Smithsonian Institution’s National Museum of American History in Washington, DC. Team ForAllSecure’s Mayhem LCP suite will be on display through September 17, 2017 in the lower level of the museum. 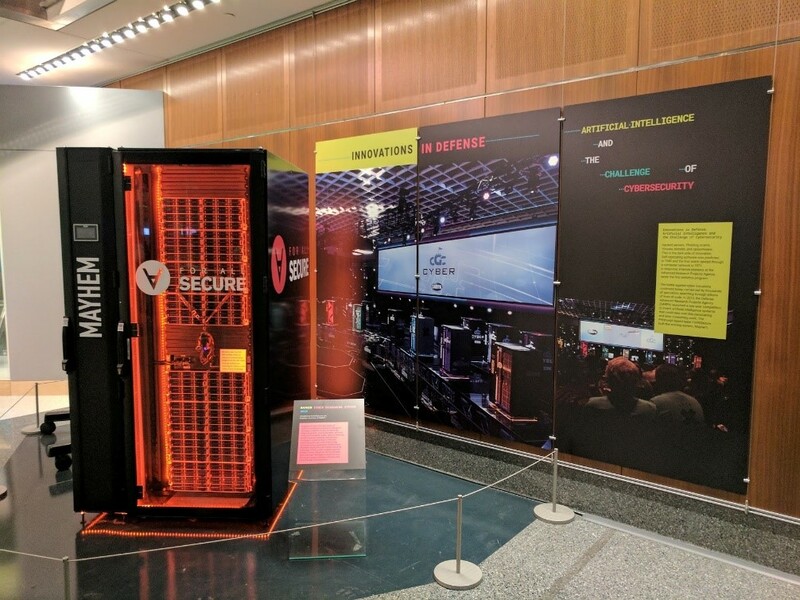 Visit the American History Museum of the Smithsonian Institution to see the DARPA/CGC – Rittal display, and to learn more about this exciting event and program. To see how Rittal helps clients deploy cutting-edge IT solutions, download the free Edge Infrastructure Handbook.